On January 19, 2011, Trilateralist Hugh Segal came out with an editorial in Canada’s foremost national newspaper, The Globe and Mail, advocating a so-called guaranteed annual income for Canadians. Incidentally, The Globe is the newspaper that another Trilateralist, Jeffrey Simpson, is national affairs columnist for. See the Trilateral Commission’s latest North American membership list from their own website here. Hello Fellow Writer, What you ˙have here really have me interested up to the last sentence, and I hafta say to you I almost never read the full length post of blogs ’cause I often got bored and tired of the trash content that is presented to me on a daily basis and I simply end up checking out the pics and maybe a headline, a paragraph and so on. But your headline and the first paragraphs were great and it instantly forced me to stay. So, I just wanna say: nice and rare job! Thanks, really. 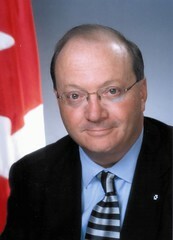 On February 18, 2011, Segal called for Canada to push for a North American Union in one of Canada’s national newspapers.